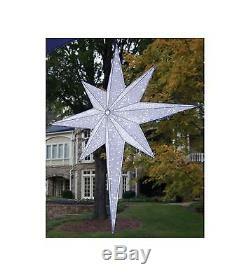 36 LED Lighted White and Silver Moravian Star Commercial Hanging Christmas Light Decoration. This show stopping life-size commercial grade masterpiece is sure to catch attention wherever it is placed! Perfect for shopping malls, hotels, office buildings, Christmas wonderlands, or anywhere that commands attention Light the way this Christmas with a bright glow from this dramatic Moravian star with iridescent glitter accents. Onlookers will be amazed by its beauty. Product Features: Bulb color: cool white lights / white wire "Cool white" also known as "polar white" has a very slight bluish hue, creating the look of ice Star color: silver Number of bulbs: 400 Bulb size: concave wide angle. Additional Product Features: LED lights use 90% less energy Super bright bulbs Cool to the touch 64 white lead cord Comes ready-to-hang with a hook on top Mounting hardware not included UL listed for indoor or outdoor use Wire gauge: 22 120 volts, 60 hertz. 08 amps, 9.6 watts. Dimensions: 36"H x 35"W x 4.5D Material(s): acrylic/plastic bulbs/wire. The item "36 LED Lighted White and Silver Moravian Star Commercial Hanging Christmas Ligh" is in sale since Thursday, July 07, 2016. This item is in the category "Home & Garden\Holiday & Seasonal Décor\Christmas & Winter\Ornaments". The seller is "christmascentral" and is located in Buffalo, New York. This item can be shipped to United States.